If there's one thing Vinegar Hill House has down, it's charm. 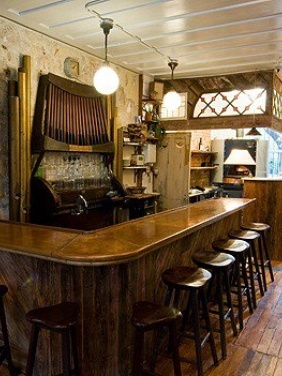 The rustic little restaurant is tucked away in a tiny, unknown-to-most part of Brooklyn. It's surrounded by cobblestone streets and quaint homes. You'll go so far off the beaten path that brunch will feel like a romantic little escape with a date. Plus, Vinegar Hill House offers a quaint backyard space for dining during the warmer months. Vinegar Hill House always serves up a couple daily specials using seasonal ingredients, but the blueberry pancakes are always a good bet. And, they are made with sourdough for a unique twist. We always order a side of the roasted potatoes served with sour cream too. They're buttery and fun to share. The classic bloody and a cold brew coffee. They use La Colombe's pure black cold pressed coffee, so it's rich and strong. Reservations are accepted for parties with as few as two people. 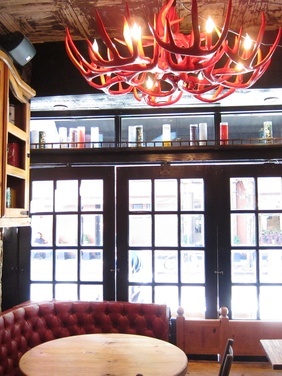 Btwn W. 4th & Bleecker St.
Diablo Royale has a lively atmosphere with fun Mexican and devil-themed decor (think devil horn chandeliers) and long tables for group seating. It's a fun spot for a party or birthday brunch due to the shareable plates, buzzy setting, and flow of tequila. Bonus: there is an East Village location too if you're more of an East-side crew. Go for the $26 deal that includes unlimited drinks and a brunch entree, and order the Huevos Rancheros. Diablo has classic Mexican fare that will pair well with the plethora of brunch cocktails heading your way. You'll also want to get a few sides of guacamole for the table. Obviously the unlimited margaritas that come with the prix fixe. Diablo Royale serves them on the rocks or frozen for those super hot summer days. Be careful, they go down a little too smooth. Mimosas, bloody Marys, Rickys and sangria are also part of the unlimited cocktail special. Reservations are accepted for parties of three or more.